Welcome...Professional offices can be a bit on the stodgy-sterile side, which rather strangely, makes them an odd place for a person to be expressing gems and buried feelings from his or her deepest corridors. In contrast, Dr. Omholt's office is a warm and variegated collection of curious artifacts that could just as easily be found in his home, as in his office. 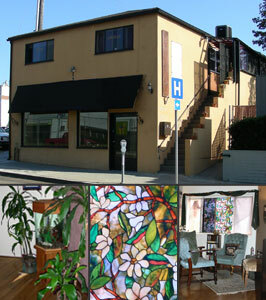 It is located adjacent to his creative lab & small production facility. From the 5 Freeway (heading south), take the Seaworld Drive exit, to Nimitiz, and then take a right onto Rosecrans St. From the 5 Freeway (heading north) take the Pacific Hwy exit, to Barnet which turns into Lytton, then take a left onto Rosecrans. From the 8 freeway, head west towards Sunset Cliffs then take Nimitz to Rosecrans. Parking can be a little difficult so give yourself extra time. There is typically parking across the street on the residential side of Rosecrans. Please give a 24-hour hour notification if you need to cancel or reschedule an appointment or pay the full fee for the missed/rescheduled session.